As the largest component in the Ledge Lounger Game Collection, The OUTDOOR PING PONG TABLE lets you be the champion of any poolside party or backyard gathering. 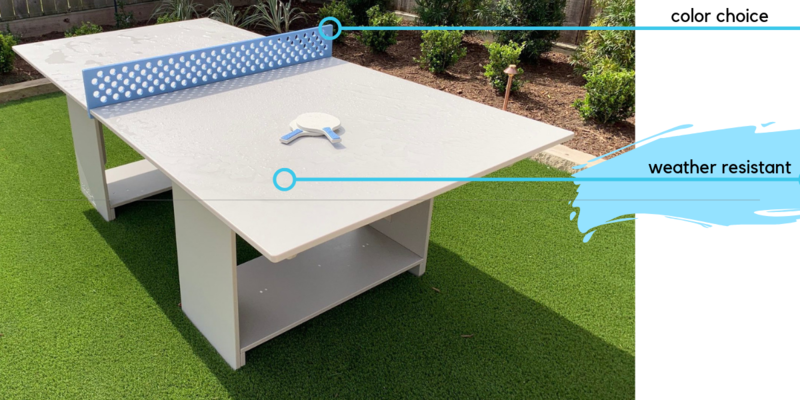 The Ping Pong Table is made of the same high-quality materials as their furniture and is available in 10 versatile colors to accent or add excitement to your outdoor game space. Customize your table and choose your frame and net color combinations to add some personalization. The PING PONG TABLE poses no competition for the elements and is designed for kids and adults alike to make memories with family and friends. With Ledge Loungers trademark quality construction and durability, the Ping Pong Table can endure even the toughest competition. The Ping Pong Table comes with 2 paddles and 4 ping pong balls so you can start playing as soon as it is assembled. Ledge Lounger® products are made to last and are backed by a two-year warranty against defects in material and workmanship. Proof of purchase is required. This warranty applies only to the original owner. This warranty is void if the products are structurally altered or subjected to stress beyond the physical limits of the materials used in body or components, or is damaged as a result of abnormal use. Normal wear and tear is not warranted. This warranty does not include any manufacturer responsibility for any incidental or consequential damages resulting from the use of the products. Here is how to get your Ledge Lounger warranty claim reviewed: 1) Submit a warranty claim by contacting our BOTANIK or Ledge Lounger customer service teams at 713-364-9669 or 347.875.0356, or by emailing info@shopbotanik.com or info@ledgeloungers.com. Please include your name, invoice number, contact information, pictures and a description of the problem. 2) Ledge Lounger will review the claim and repair or replace, at our option, any product determined by Ledge Lounger to be a manufacturer’s defect.